Irina graduated from the Metoda Cosmetology School in Moscow and Paul Mitchell the School. She has earned her certifications from Redken, Wella, Aveda, and Schwarzkopf colors. Irina has certifications in Hair Extensions and La Brasíliana Keratin treatments. She has been licensed since 2001, specializes in wedding up do’s, is versatile with men and women’s haircuts, and loves being creative with all aspects of color. 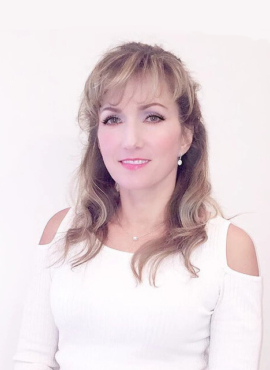 Irina joined us from Salon Nordine Day Spa Reston, VA. With her years of experience in Europe and America she enjoys helping people to find their personal style and look beautiful.